Practicing certified nurse midwife since 2006; preceded by more than 25 years experience as a labor and delivery nurse. Received master's degree in nursing from Case Western Reserve University in 2001 and midwifery certification from the Frontier School of Nurse Midwifery and Family Nursing the same year. Colleen and her husband, Gary, reside in Avon Lake where they have raised their blended family of seven children. 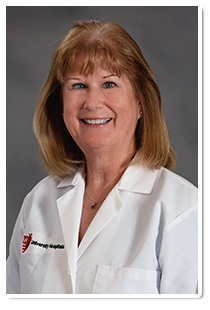 Known for spending extra time with patients, her primary goal is providing safe, competent, and compassionate care. Provides care to healthy women during pregnancy, labor and delivery, and postpartum; available options include holistic and waterbirths. Also performs Pap tests, breast exams, contraception and family planning options, and treatment of bladder and vaginal infections. Privileges at St. John Medical Center & Fairview Hospital.